Braden Pollock is founder and CEO of Legal Brand Marketing, LLC a marketing firm specializing in legal industry and primarily serving the DUI defense legal community. The company offers lead generation services through thousands of internet properties. Braden is an equity investor and board member of Epik, LLC, a leading domain development software platform. He holds substantial equity positions in SignatureFiling.com and ScienceFiction.com as well. The former being a business documentation service and the latter being a niche science fiction portal and blog. Both of which are independent internet based businesses. Braden owns an ignition interlock (car breathalyzer) business with a couple of hundred brick-and-mortar service locations throughout the country. Additionally, he maintains a real estate portfolio and is active in the auto insurance space. Braden’s latest venture is a technology that will allow for the distribution of lead generation forms, surveys and display ads for the domaining and registrar industries. MO: How have you been able to acquire over 13,000 websites and how involved are you in managing them? Braden: I’ve been actively buying domains since about 2005. I review expiring domains on a daily basis, participate in auctions, plus I make offers for domains that I want. In addition, other domainers send me portfolios that they’re interested in selling. There are some dozens of sites that are managed by my marketing company, LBM as well as some that are managed in-house by my other companies. There are about 10,000 that have been platform developed and are managed by Epik, DevRich and others. MO: Why did you choose to focus on the DUI and DWI legal aspect of the industry? What attracted you to this niche market? Braden: When I got into this niche 8 years ago, it was because no one else was doing it. People will forever drink and make bad decisions, right? DUI enforcement continues to increase along with the associated penalties (e.g. interlock devices, fines, jail, etc). Besides, there are more people arrested for DUI in this country than any other crime – 1.4 million arrests each year. So it just made sense. It’s a growing market. In all honesty, I knew nothing about lead generation back then. I thought this was a marketing play. Over the years it’s morphed into lead-gen.
MO: How have managed to put together an online and offline business that is so perfectly integrated? Braden: I try to dove-tail my businesses to take advantage of resources I already have. 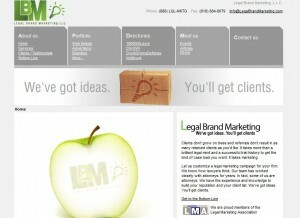 LBM has controlled the lion’s share on the online DUI market for a long time. So the question we ask is what else can we offer DUI offenders? How about ignition interlock, insurance, eBooks? What can we offer our lawyer clients? Other marketing services, web design, logo design, email newsletters, magazine mailers… The idea is to create our own eco-system. MO: Do you have a formula for domain buying and selling? Any tips for our readers who are in the same industry or are interested in getting started? Braden: Most Domainers focus on resale value of domains. I look at the traffic value. If a particular (exact) term is searched, say 10,000 times per month and you can buy that exact domain, let’s assume you would get one conversion per month. (there are many variables that impact conversion rates.) What’s that conversion worth? It could be a lead, an affiliate sale, an eBook, etc. Let’s give it a value of $10. That may not sound like much if you only have a few websites, but what if you had 1000 or 10,000? The idea behind long-tail (niche) domains that don’t have a lot of traffic, is scalability. If you have the capacity to build and maintain thousands of websites, you only need to make a few dollars from each one to make a lot of money across the portfolio. MO: You regularly speak at conferences, what are delegates most interested in hearing about? What are your hottest topics? Braden: I’m primarily asked to speak about lead generation. For years, most domainers have been making a nice profit without doing much work by simply parking their domains. Now that parking revenues have fallen off a cliff, everyone is looking for an alternative monetization source. Lead-gen is one of those sources. I click on an ad feed will generate pennies, while a lead will generate dollars. Domainers want to know how to get into lead generation so I explain how they can do it. MO: You have a very full plate, however, are there any ideas, products or services that you’re specifically excited about in 2012? This has been in the works for a very long time so I’m excited to see it launch later this year.